Finish Warranty - Paint & Anodizing - SAF - Southern Aluminum Finishing Co, Inc. SAF – Southern Aluminum Finishing Co, Inc.
SAF’s SAFinish Paint & Anodizing Finish Warranty information follows. 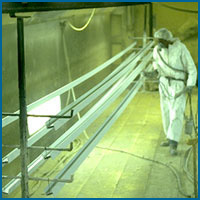 Limited warranties are available from Southern Aluminum Finishing for SAFINISH coatings only. A twenty year limited warranty may be available upon SAF approval of project location and environment. A twenty year limited warranted may be available upon SAF approval of project location and environment. SAF offers a standard five year warranty and a twenty year limited warranty may be available upon SAF approval of the project location and environment. Each warranty must be approved by SAF in advance based on the job site location and metal requirements. No other warranties either expressed or implied are applicable unless so stated in writing. Kynar 500™ is a registered trade mark of Arkema Inc.
Hylar 5000™ is a registered trade mark of Solvay Solexis.